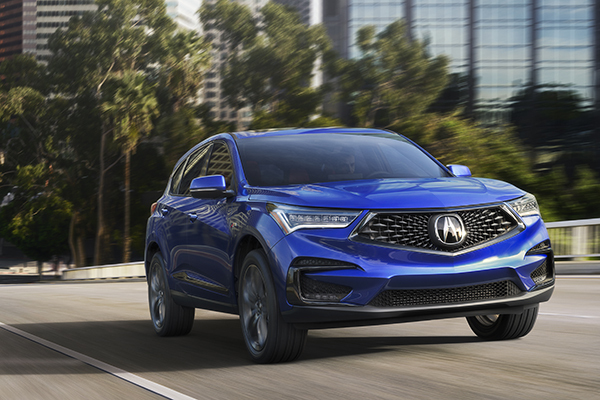 Mar 21, 2019 - TORRANCE, CALIF; The 2019 Acura RDX is the 'Best Luxury Compact SUV for Families' according to the experts at U.S. News and World Report the all-new RDX received the highest composite score from U.S. News and World Report's automotive experts – earned through a combination of professional automotive reviews assessments, safety and reliability ratings, seating and cargo volume and the availability of family-friendly features. Since its June 2018 launch, the 2019 RDX has recorded nine consecutive months of sales records, helping RDX set a new all-time annual record in 2018 and earning RDX the title of America's top retail-retail compact luxury SUV, among the top three models in all of luxury. On the safety front, the 2019 RDX has received the highest possible safety ratings of a TOP SAFETY PICK+ from the Insurance Institute for Highway Safety (IIHS) and a 5-star Overall Vehicle Score from the National Highway Traffic Safety Administration (NHTSA). The RDX features AcuraWatch® advanced safety and driver-assistive technology as standard equipment on all models, along with Acura's Advanced Compatibility Engineering™ (ACE™) body structure and eight airbags, including new driver and front-passenger knee airbags. Debuting the next-generation of Acura design, performance and technology, and the model's first-ever A-Spec variant, the all-new 2019 Acura RDX features a class-leading array of premium features and technologies and a Manufacturer's Suggested Retail Price (MSRP) starting at $37,300 (excluding $995 destination and handling). The 2019 RDX is built on an all-new, Acura-exclusive body and chassis architecture and incorporates a host of new premium features and technologies, including Acura's award-winning True Touchpad Interface™, an ultra-wide panoramic moonroof and next-generation Acura sport seats with up to 16-way power adjustability. The 2019 RDX is powered by a direct-injected and turbocharged 2.0-liter, 16-valve powerplant with DOHC VTEC® valvetrain mated to the segment's only 10-speed automatic transmission (10AT). Peak output of 272 horsepower and 280 lb.-ft. of torque (SAE net) bests RDX's key competitors from Mercedes, BMW, Audi and Volvo. The RDX is available with Acura's Super Handling All-Wheel Drive™ system, capable of distributing up to 70-percent of torque to the rear wheels, and up to 100-percent of that torque to either the left or right rear wheels, creating outstanding control and agility. The 2019 Acura RDX is the first RDX to be designed and developed in America. Like its predecessor, the new RDX is manufactured in East Liberty, Ohio, using domestic and globally sourced parts, with the powertrain produced at the company's plants in Ohio and Georgia. About Acura Acura is a leading automotive luxury nameplate that delivers Precision Crafted Performance – a commitment to evocative styling, high performance and innovative engineering, all built on a foundation of quality and reliability. The Acura lineup features six distinctive models – the RLX premium luxury sedan, the TLX performance luxury sedan, the ILX sport sedan, the five-passenger RDX luxury crossover SUV, the seven-passenger Acura MDX, America's all-time best-selling three-row luxury SUV, and the next-generation, electrified NSX supercar.